I don’t get my gear ready and think, “Wow, I hope I can find some leaves in the ice today!” I tend to come upon things that capture my interest. I have always been drawn to transparency and light. Anything with complimentary colors makes me take a second look. Texture intrigues me. Sunday I thought I should head over to the mass of daffodils on my hillside when I encountered this – the ice from the top of the birdbath, cast aside and melting into the grass. It stopped me for almost an hour. I forgot the daffodils, I know they will still be there on the next sunny day. You have to appreciate ice while it’s here. It melts is fast and then it is gone forever. 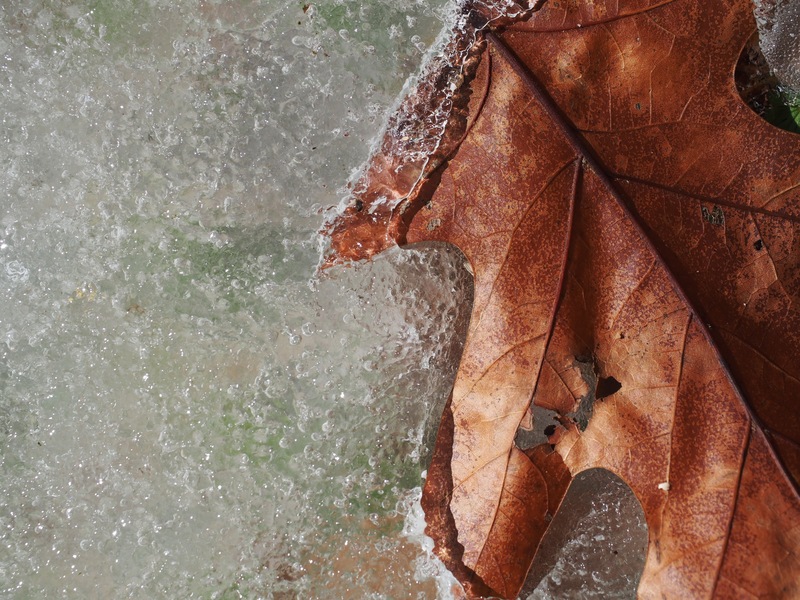 This entry was posted in foliage, Macro Photography, Ozarks, Photography, still life and tagged ice, leaves, macro, macro photography, Olympus, Olympus E-M5, Ozarks, photography, Winter by artsifrtsy. Bookmark the permalink. great photos, love the photo of the road through the trees at the top of your blog now. Thanks – that photo is my road. A few inches of snow and it’s transformed into something more scenic than it really is. These are so beautiful, funny how that happens. Love the patterns on the ice you’ve captured. (I always vow to go for just a ‘short’ walk and always get distracted and walk in my front door 3-4 hours later, so I know how one can get sidetracked). 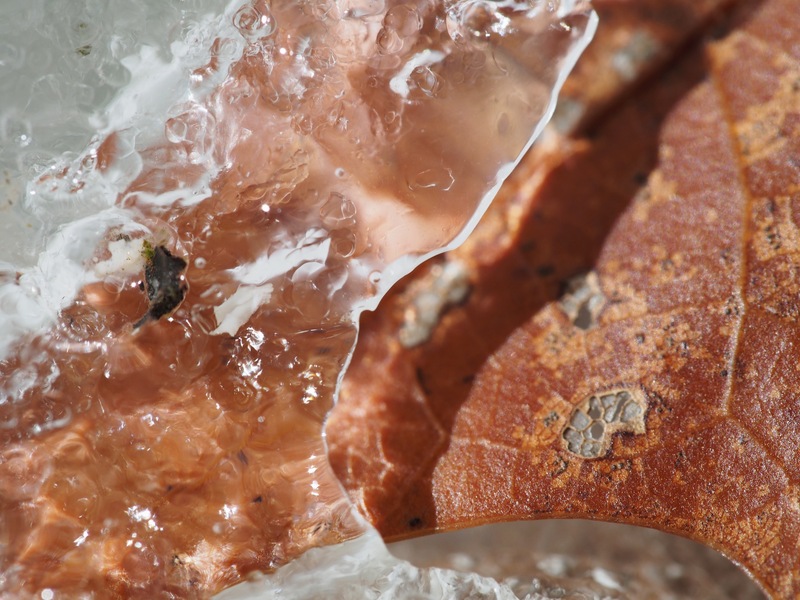 Thanks Vicki – I wish I had shot some focussing more inside the ice, but time got away from me. Isn’t that the way it goes – I did finally get to the daffodil buds. Completely agree with your first paragraph. Great photos. Awesme photos! I love when icicles hang off roofs as well! I don’t know how you ever get anywhere, but I’m glad you stop, click and especially that you share! Well then, I’m glad you get to your computer! 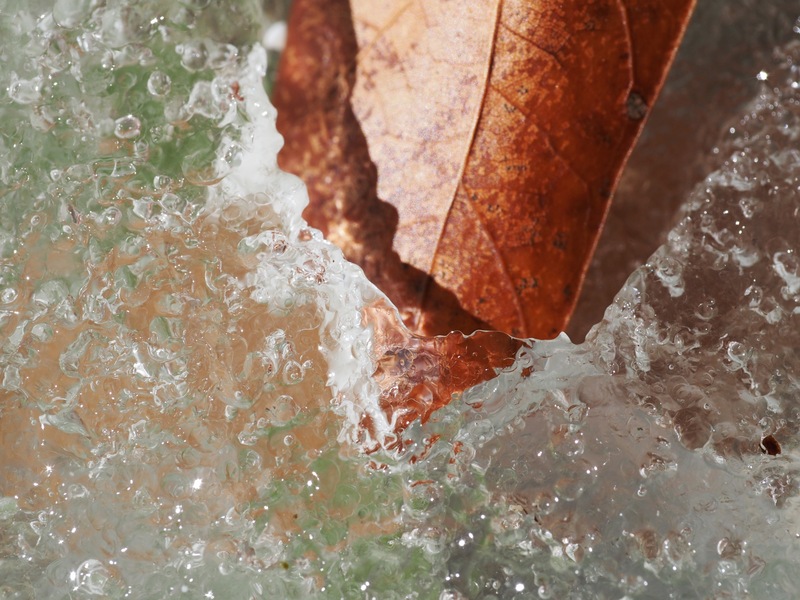 I have used the same process, gone after a similar leaf in frozen water look and never come away with beautiful photos like these – that is what I saw. I particularly like the last one. Thanks Lyle – I think that the ice was in the sunlight with grass underneath helped. I have a nice little macro lens that gives me that very shallow DOF on shots like this too. LOL – I have a 90mm equivalent. It’s a Leica and I love it. I have an old bellows macro set up I want to play with this spring. Ooh love it! I didn’t expect that shadow to be from the ice for some reason. I thought it’d be from the curve of the leaf. Then the angles matched the ice. Very cool! 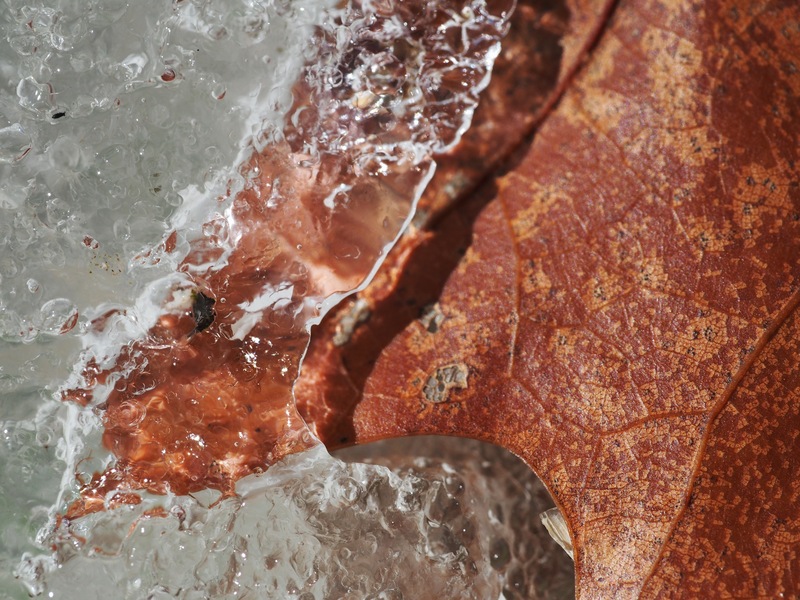 Thanks – I think the leaf started inside the ice and it melted away – those curves just matched too closely. Gorgeous! A few more weeks and no more ice but plenty of color to keep you inspired! I am sooooo looking forward to color and springtime, but for now I’ll take it where I can find it – Thanks!